President Obama’s remarks at the White House on Monday celebrating the 20th anniversary of the Americans with Disabilities Act were eloquent, passionate and memorable. Speaking after performances by Patti Labelle and Marlee Matlin, Obama thanked the champions of the original ADA — signed by President George H. W. Bush in 1990 — for passing what he calls one of the most comprehensive civil rights bills in the history of this country. 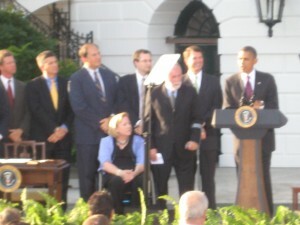 After giving a nod to those who have died while working to advance the disability cause, namely Senator Ted Kennedy and Justin Dart, known as the the father of the ADA, Obama commemorated what the ADA has accomplished so far. “It was about the young girl in Washington State who just wanted to see a movie at her hometown theater, but was turned away because she had cerebral palsy; or the young man in Indiana who showed up at a worksite, able to do the work, excited for the opportunity, but was turned away and called a cripple because of a minor disability he had already trained himself to work with; or the student in California who was eager and able to attend the college of his dreams, and refused to let the iron grip of polio keep him from the classroom,” Obama says. He told the audience of invited disability advocates and Congressmen that the disability movement “became a massive wave of bottom-up change that swept across the country as you refused to accept the world as it was” as people marched organized, and testified to change the laws and the minds of Americans. The President recalled visiting with the father of his wife, Michelle, who had multiple sclerosis. “By the time I met him, he had to use two canes just to walk. Michelle’s father, though stricken with MS when he was 30 years old, “never missed a day of work; had to wake up an hour early to get dressed to get to the job, but that was his attitude — so what. He could do it. Other elected officials in Washington who have pushed for the ADA have had direct experience with disability. Kennedy’s sister Rosemary lived with an intellectual disability and was sent to live in an institution. Congressman Steny Hoyer’s wife battled with epilepsym, while Congressman Tony Coehlo, a sponsor of the act, also had epilepsy. Senator Tom Harkin, a staunch advocate of the ADA, has a brother who is deaf. All of these people “understood this injustice from the depths of their own experience … and understood that by allowing this injustice to stand, we were depriving of our nation and our economy of the full talents and contributions of tens of millions of Americans with disabilities,” Obama says. “Today the ADA is about more than justice. It’s about equal access to the classroom, the workplace, and the transportation.” But there’s a lot more to do: Only five percent of the federal workforce is made up of Americans with disabilities, Obama says. Obama also talked about healthcare reform, and the Affordable Care Act that he believes will give Americans with disabilities better control over their own lives than any legislation since the ADA. The act expands Medicaid eligibility, subsidizes insurance premiums, provides incentives for businesses to provide health care benefits, prohibits denial of coverage or claims based on pre-existing conditions and establishes health insurance exchanges. Harkin’s brother passed away several years ago. I WATCH THE VIDEO BUT I GOT CC FOR BEGIN THEN SHORT THERE HAVE NO CC. PLEASE PUT ON ALL CC THE STORY.